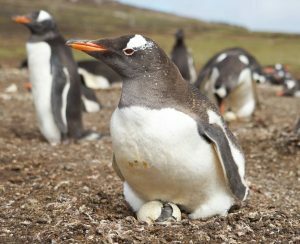 The Gentoo penguin population in the Falklands also varies greatly (1,2). Whether this variation has natural causes or is human-induced, is open to debate (3). Studies on the breeding biology of Gentoos in the Falklands have shown only marginal differences when compared with their conspecifics living at the Antarctic Peninsula and the Indian Ocean (4). Unlike all other penguin species, Gentoos stay close to the coast throughout the year and regularly return ashore. Thus, they are under permanent threat from human activities both on land and at sea (5). Currently, we are investigating a small, recently established Gentoo Penguin colony on Isla Martillo in the Beagle Channel, Argentina, with regard to inter-specific competition to other seabird species.